Oxford, Miss—On July 1st, 2015, the University of Mississippi’s National Food Service Management Institute (NFSMI) announced that it has changed its name and logo to the Institute of Child Nutrition (ICN). As a part of UM’s School of Applied Sciences, ICN is the only federally funded national center dedicated to child nutrition. For over 25 years, the Institute has been the leading child nutrition center in the United States, providing high quality resources, training, and research. During that time, the Institute has experienced tremendous growth in the amount of resources and services provided. Inspired by this growth, the Institute searched for a new name that would reflect its image of professionalism and service in the field of child nutrition. ICN also announced its new Acting Executive Director, Dr. Aleisha Hall-Campbell, who was previously the Associate Director of Cooperative Agreements for NFSMI. A search for a permanent executive director will be initiated once ICN completes its name change and rebranding. The staff at the Institute looks forward to ongoing success and growth as ICN remains dedicated in serving child nutrition professionals during this exciting time of progress. 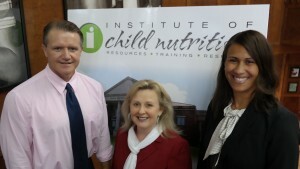 More information and resources about the Institute of Child Nutrition, visit http://www.theicn.org.